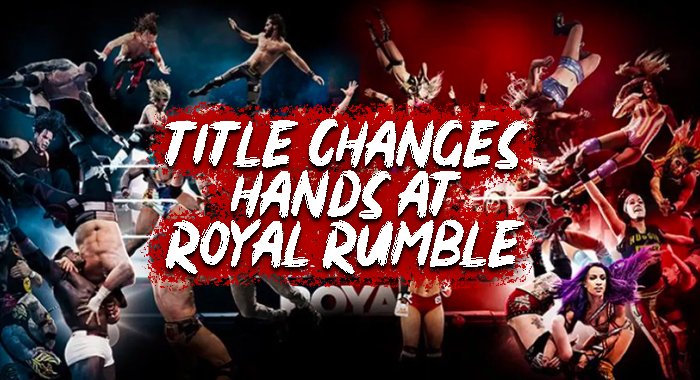 This year’s WWE Royal Rumble pay-per-view kicked off with a bang, as Shinsuke Nakamura defeated Rusev to reclaim the United States Championship. The match took place as a part of a two-hour kickoff event on the WWE Network. The “Bulgarian Brute” will certainly have a case to please this Tuesday night on Smackdown Live, as he didn’t exactly lose the title, clean in the middle of the ring. When Nakamura attempted to remove a corner turnbuckle, the “Ravishing Russian” Lana climbed onto the ring apron to inform the referee that her husband’s opponent was cheating. This of course turned into a Looney Tunes skit wherein Rusev went after Nakamura but accidentally crashed into Lana, knocking her off the apron and apparently inuring her ankle. When the champion went to check on his wife, the challenger snuck out the victory by rolling him up for a surprise pin.